A pregnant political activist entered a glitzy arms industry dinner in Westminster, commandeered a microphone and warned assembled arms dealers and MPs that making profit “causing death and destruction around the world” is unacceptable. After making her way to a microphone undetected, Anne Marie O'Reillyexpressed concern her unborn child would face a world where arms dealers profit from human suffering and bloodshed. The anti-arms activist’s unexpected intervention left the crowd somewhat stunned. While O'Reilly's unassuming manner initially drew a warm reception, her criticism of the UK establishment’s links to the arms trade was followed by a long and awkward silence. Before being escorted off stage, O'Reilly suggested arms dealers in the audience should reconsider their careers. The UK arms industry, which profits from brokering arms deals with questionable regimes and conflict-ridden states worldwide, is backed and subsidized by the British government. 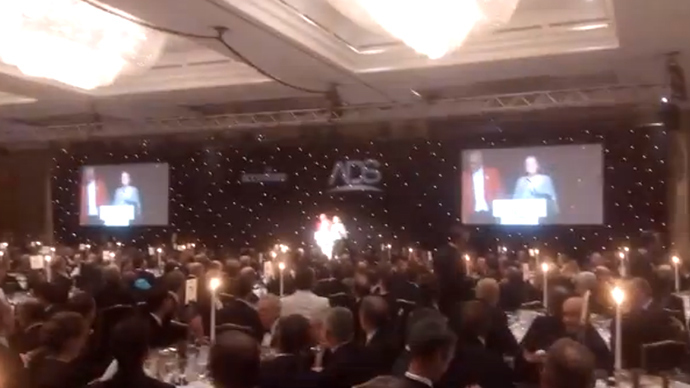 Tuesday’s annual dinner, which cost attendees £246 per head, was hosted by ADS – a trade body for British Aerospace, and other defense, security and space companies. The group represents a collective of the world’s 50 largest arms firms. The opulent soiree was attended by Britain’s Business Secretary Vince Cable, the representatives of 100 arms firms across the globe, over 40 British MPs, 30 civil servants, and 30 Ministry of Defence (MoD) personnel. Andrew Smith, of UK think tank Campaign Against The Arms Trade (CAAT), said the event was a hotbed of lobbying. “The arms companies don't invite politicians because they want to be nice, it is because it's good for business,” he told RT. CAAT was provided with a list of all MPs who attended the lavish dinner. The document also detailed their seating arrangements. Tobius Elwood MP, a Foreign and Commonwealth Office minister, was seated at Cobham PLC’s table. The firm is one of the biggest arms companies in the world, and is headquartered in Dorset. Cobham has applied for arms export licenses to Saudi Arabia, Israel, the UAE and Turkey, according to CAAT. Margaret Curran MP, shadow secretary of state for Scotland, was seated at the table of US-headquartered arms manufacturer Raytheon. Raytheon makes the targeting system for the Reaper drone deployed by the CIA and other states to conduct strikes across the globe.The firm has also been linked to manufacturing components for bombs deployed in the 2014 Gaza conflict. Business Secretary Vince Cable, who spoke at the event, sat at the top table beside Shadow Secretary for Defence Vernon Coaker and a group of ADS executives. CAAT’s Andrew Smith said Cable’s decision to speak at the dinner was telling. “The fact that a group like ADS is being addressed by Vince Cable MP, the Secretary of State for Business, is a sign of how powerful they are,” he argued. Also present at the extravagant event were controversial arms firms Thales, BAE Systems and MBDA. Thales is the eleventh largest arms firm in the world, and has sold military wares to some of the most oppressive regimes across the globe, according to CAAT. BAE Systems, which had three MPs at its table, is Europe’s largest arms firm, and has also supplied multiple repressive governments. Among the regimes BAE Systems sells to are Saudi Arabia, Bahrain and Mubarak's Egypt. MBDA is a missile company partially owned by BAE. It sold military wares to Muammar Gadaffi’s government in 2007, and its military hardware was deployed by Britain and France in the 2011 bombing of Libya. The company’s missiles are also thought to have been supplied to rebel groups in Libya, CAAT says. Probed on the impact of Britain’s government-backed arms trade, Smith said the UK facilitates rampant human rights abuses abroad. “When the UK sells weapons to regimes like Saudi Arabia, Qatar and Bahrain, it doesn't just provide military support, it also provides political support and a UK endorsement for the human rights abuses that are taking place,” he said. “The fact that arms dealers were swilling champagne with over 40 MPs is a disgrace and shows the extent of the arms trade's connections and political lobbying,” he added. On Tuesday, it emerged the Prince of Wales allegedly wants to end his role as a promoter of British arms in Gulf States. The revelation was unveiled by an unauthorized biography documenting Prince Charles’ life, which was published on Thursday.